Having trouble connecting your FC to a computer, or flashing FC firmware? Very often it’s an issue with flight controller driver. This tutorial hopefully can help you fix it in a few simple steps. Then the FC COM disappears, and it appears again when you unplug the FC and plug it back in… The same problem keeps happening when you try to flash the FC. If you are able to connect your flight controller to Betaflight GUI, but you just cannot flash firmware. In which case please follow these steps to resolve the problem. If you cannot connect to GUI at all, please try the “bootloader fix” first to flash the firmware. If that doesn’t help then read on. Try restarting your computer and repeat the above before moving on. You can find out whether your FC is the CP2102 or VCP in order to choose the suitable solution to fix your driver issue. Connect your FC to the computer with USB cable. This tool will automatically search for your FC, and install whatever driver you need on your computer. Once that’s completed successfully, the driver should be installed. Now fire up Betaflight Chrome App GUI, and you should see “DFU” next to the connect button, rather than the usual COM port in the text box. You should now be able to flash the FC as you normally would. Once done, your COM port will reappear in the text box. And you should be able to flash the FC from now on without any issues on this computer. If you have a flight controller with CP2102, you need to install the CP2102 driver. Note that with SPRF3 boards, you might want to try changing the baud rate to 256000 first, maybe that would do the trick. First of all, connect your FC to the computer via USB. Without proper driver it’s difficult to tell where it is in Device Manager. The easiest thing to do is to use Zadigto find it. You can download both the CP2102 and Zadig drivers on the front page of the Betaflight Configurator. Run Zadig, choose your flight controller in the drop down list (1). There are going to be many options but choose the one that is more likely to be your FC. After the green arrow select WinUSB (2), and press replace driver (3). After that you should find the “CP2102 USB to UART Bridge Controller” under “Universal Serial Bus devices”. The one that isn’t greyed out. Right click on it and click Update Driver Software. 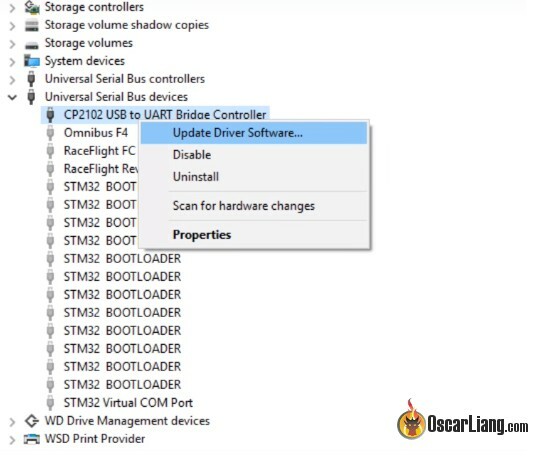 Select the driver you want to install, Silicon Labs, CP210x USB to UART Bridge. And that’s it, the COM port of your FC should now appear in the FC configurator. Try to un-select “Full chip erase” option before flashing, and you could “erase settings” in CLI after the firmware flashing. Type “Default” in CLI to reset all settings. Had to comment to say thank you !! My Diatone GT M3 V2 won’t connect to Betaflight or let me flash the firmware. When I connect the battery it beeps 3 times only, not 5 as it should. Please, I’ve been looking for an answer to this for hours and hours.The FC appears to work because it has its green light on, steady. I use a Mac laptop so I don’t think is a matter of drivers. Please give some some advice to fix this. Thank you!! So I’m having an issue I’ve never seen and cannot seem to find a solution. My FC shows up fine at com5, and I can start the connection. It just says connecting for a moment, saying successfully serial port successfuly opened then changes to successfully closed. Everything is brand new, this is a first time setup on this quad. Thank you very much for this tutorial, I had been looking for a solution to my problem for a long time. The Impulse Driver Fixer works! Spent hours looking for a solution. Thanks! My FC won’t connect after a hard impact that broke the nylon standoffs. When I plug it into USB all windows does is make the ‘usb connection’ sound over and over. I can connect with my other quads. Is the FC cooked? The original 4 in 1esc is good and being used, but I wanted to try and salvage the FC if possible. I’ve even tried shorting the boot pins but nothing. My spf3 wont talk to computer anymore after flashing. My other quads all still connect fine. Is my usb on fc cooked?? Hi, I’ve done all this, when I plug the FC board into my computer with a good cable windows recognizes it, but none of the configurators will show it. I’m using impulse RC and I instaled before a lot of usb drivers. Now when I simply want to connect another FC board, there’s the “failed to open serial port” . I’m using Impulse RC at every connections with new FC board and it works! Is it normal to use it every time? Conflict with USB? Might be worth mentioning that if COM port doesn’t show up after flashing the FW, you might need to install the STM32 VCP drivers. Another thing that I’ve experienced is conflicts in COM ports with other USB-to-serial drivers (Prolific, FTDI, etc.) so it might be worth removing those if you’re having trouble. thank you David, that’s excellent advice !